This wireless PTZ camera is a small sized Pan Tilt Zoom camera that works over WiFi. It can be a great addition to an existing DVR or NVR based security camera system from CCTV Camera World, or can be used as a standalone camera for viewing from a PC or Mac. It provides beautiful 2K resolution video thanks to its 4MP resolution image sensor. It allows the user to select either H.265 or H.264 video compression. H.265 can provide up to 50% savings in storage while maintaining the same video quality when compared to H.264, which can be helpful in conservation of wireless bandwidth. For best results, we suggest using a wired NVR or wireless NVR. This security camera can be powered by a 12VDC adaptor to provide local power to the camera. It is capable of storing recorded video to an microSD slot built into the housing that can recognize up to 256GB. This feature comes in helpful if you are using it as a standalone camera, and even offers added security as you can record to the SD slot and an NVR. If the NVR were ever to be removed by would be thieves you would still have footage stored inside the camera. Note the microSD card is not included. If you are using this Mini PTZ IP Camera for live surveillance, you can zoom in up to 100ft away to pick up a license plate from a parking lot in daylight conditions. It is also a great camera to keep an eye on the workplace while away. Plus, with advanced image enhancement features such as WDR you'll get usable images out of just about any lighting condition. This 2K PTZ camera offers the ability to set presets and patterns with ease directly on the camera or on the NVR. 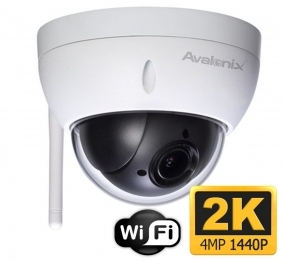 This camera like our other IP cameras and IP security camera systems offers the capability of monitoring video remotely. You can view the feed using its built-in web server and an internet browser on Windows or Mac computer. You can even use our iPhone app and Android app to remotely view and control the camera. This camera is rated IK10 impact resistant and IP66 for outdoor use, and is also great for indoor use, as in a warehouse, office, jewelry store, or lobby. Please note all WiFi cameras require a strong wireless signal from the router or wireless NVR. Placing the camera far away or with dense obstructions in between the signal path will diminish the quality of the video stream. A camera with a built-in WiFi radio should not be used more than 250ft away from the wireless signal. As a rule of thumb, the camera needs 90% WiFi strength for optimal operation. Here's how to configure our wireless security cameras to connect to your WiFi router.